Urinary tract infections can be painful, dangerous or even fatal for your cat, but what can you do to help them avoid or overcome these conditions? Does My Cat Have a UTI? With proper diagnosis, your veterinarian can determine the cause of your cat's infection and recommend the best possible treatment to relieve the condition. 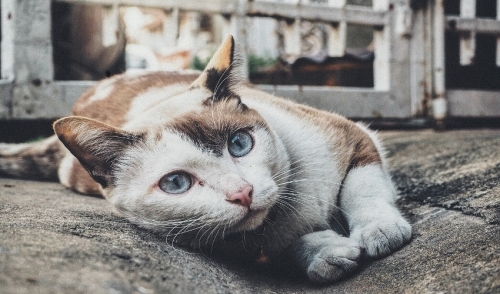 Creating a Low-Stress Environment: Because high anxiety can use UTIs, adjusting your cat's environment for lower stress can help alleviate these infections. Allow your cat access to see out windows, crack a window for natural air flow, provide more stimulating toys and take time to bond with your cat to lower their stress and improve their health. Dietary Changes: A principally dry, lackluster diet can contribute to your cat's urinary tract infections. Instead, change to wet canned food and entice your cat with tastier tidbits. The healthier their diet, the more they will be able to fight infections and recover quickly. Low salt cat food formulas can also be helpful for cats prone to UTIs. Increase Water Intake: While cats will not naturally slake their thirst at the water bowl, keeping more water available can help improve their water intake and alleviate UTIs. Provide multiple water bowls in convenient locations, and refresh the water daily to improve its flavor and appeal for even the pickiest cats. A splash of tuna or chicken juice in the water bowl may also help encourage more drinking. In extreme cases, a urinary tract infection may require catheterization, surgery or hospitalization. Your veterinarian will choose the most effective treatment methods to help your cat recover. It can be traumatic to work through your cat's UTI, but fortunately prevention is relatively easy and can spare your cat the agony of these infections. The same steps that may be used to treat mild infections – lowering stress, changing diet, improving water intake – can help keep feline UTIs from recurring. Stay alert to your cat's urination behavior at all times, examining clumps in the litter to ensure your pet is passing enough water, and you will be able to seek veterinary guidance as soon as possible in case of an infection.